I don’t actually know what the best way is to take notes on my reading and writing conferences with my students. But a new method (to me) has recently descended upon me that is working pretty well. It all came about when I realized several weeks ago that I wasn’t doing a very good job recording conference notes in my gradebook. A short sidestep is necessary here: having the notes in my gradebook, has become my new favorite way to keep track of the instructional conversations I have with my students. Not only can I see the notes, but anyone else who has access to gradebook data for an individual student can see the notes as well. Students can review what we talked about. Parents can see what kind of instructional conversations I’m having with their students in the classroom. My special education students’ case managers can see what suggestions I’ve given for their work and can follow up on them. In short, it gives everyone in a student’s circle of support access to the same set of data I use to keep track of the individualized instruction I offer for each student through our conference conversations. And the gradebook makes a surprisingly useful database for conference notes. I can hover the cursor over any cell that has a note with it, and the note will pop up in a bubble. This makes it incredibly quick and easy to survey my conference data and figure out a plan of attack for instruction based on the current needs of my students. But it was early March, and the columns in my gradebook for conference notes were way too empty for it being mid-semester. I had to ask myself what was going on. I realized I didn’t want to carry my computer around anymore. Though typing the conference notes right there while the conference is wrapping up is incredibly efficient–no data entry time needed later–I was growing tired of finding a place to set my computer down so I could type, or of balancing it on my left arm while I typed away (badly) one handed with my right hand. Rather than making students come to me one at a time where I might be sitting at a desk or something with my computer set up (I end up talking to fewer students), I like to be out and about with my students as they work, pausing for conference conversations as I circulate (I end up talking to more students!). But carrying the computer around was becoming the limiting factor. I kept opting for leaving it at my desk instead. For January, February, and March, I was having lots of instructional conversations with my students, but I didn’t have the data to show for it. That’s no use for anyone. Not for me, not for my students, not for anyone. How am I supposed to plan for instruction when I can’t look across my conference notes? How am I to expect that I’ll remember every single conference conversation that I have with my students? I needed those notes! I had to do something differently. 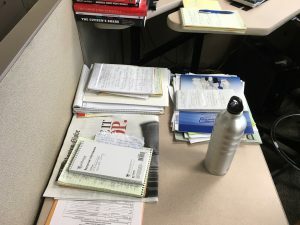 Proof that journalists use reporter’s notebooks: my friend’s desk at The Boston Globe. I looked at one of the many reporter’s notebooks I have stashed away in my desk. As a newspaper adviser, I tend to collect them. 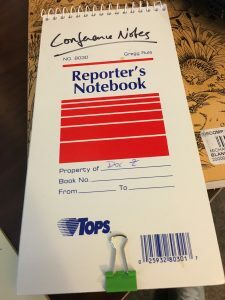 Nearly any conference for journalism advisers includes a free reporter’s notebook. There’s a reason reporters actually use them. They are small and easy to carry around, easy to write with as you hold them in your hand. So I grabbed one. I wrote “conference notes” on the front with a sharpie. Off I went. Now, when I am circulating among my students as they are working, I make sure I have the reporter’s notebook with me. And I’m brutal with myself–any conversation that has even a hint of instruction to it means I’m taking notes. The notes are likely not legible to any person but me–but I’m also committed to transferring my notes from the reporter’s notebook to my gradebook as soon as possible after class is over so I can capture more of the detail from the conversation as I record my notes in my gradebook. Specific detail leaves my memory as time passes between the conference conversation and transferring my notes to the gradebook–the sooner I can do this the better. Holding the reporter’s notebook in my hand and writing in it is easy. It’s unobtrusive. It’s quick for taking notes. I have a ready-made surface if I wish to draw a diagram or write out a sentence as a part of my conference conversation (like I did last week–I drew out a diagram of the narrative structure of Toni Morrison’s Beloved as I listened to what was confusing my student about the book). 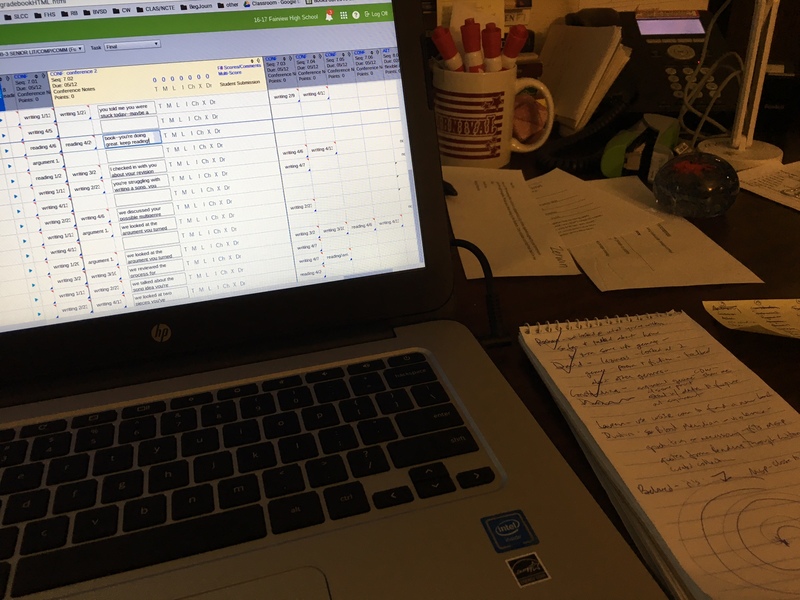 After class–as soon as I can make it happen after class–I move my conference notes from the reporter’s notebook to my gradebook. It doesn’t take very long at all. In a workshop classroom, conference conversations are central. They are the setting for the powerful individualized instruction that workshop makes possible. But I cannot harness that power unless I keep track of the conversations. This is not THE best way to take and keep track of conference notes, but it’s MY (current) best way. It doesn’t really matter how I do it–I just need to keep track of the instructional conversations I have with my students. This entry was posted in #StopGrading, conferring, feedback, gradebook, teaching reading, teaching writing, Uncategorized, workshop teaching. Bookmark the permalink.